You see the most amazing merchant at a convention or war, but then you can never find them again. You try googling, but your interests aren't exactly mainstream (right?) and the wrong things keep coming up. You KNOW there are shops / sites out there with exactly what you're looking for, but you can't find them. I'm a geek just like you, and I got frustrated trying to find things I knew were out there. Things like SCA merchants, small indie game companies, costuming supplies, and more. So I built The Geek Pages. 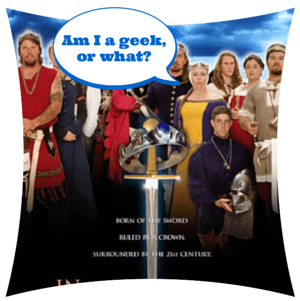 The Geek Pages is a one stop shop for geeks to keep track of those obscure things they're into. To make sure all that really cool stuff never gets lost again. Sign up to receive monthly updates with the latest articles, featured listings, and and new listings. My name is Valerie Tate Williams and I'm a geek. I'm such a geek, in fact, that I was actually in a documentary about geeks. That's me, in that picture to the left (the one with the speech bubble, in case you weren't sure). In addition to that particular flavor of geekiness (SCA), I also enjoy tabletop gaming, including board games, RPGs, etc., and am interested in things like Steampunk, Cosplay, and all manner of other geeky things. Right now is a great time to be a geek. Superheroes on the big screen, space probes landing on comets, even cosplay on TV. There is so much cool stuff out there, in fact, that I built this site to make it easier to find. Welcome to the Geek Pages. A directory for geeks.